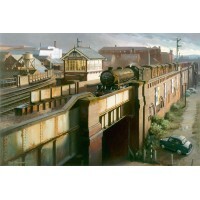 The Guild of Railway Artists offers the biggest and best selection of fine art railway prints and publications: Steam and diesel locomotive portraits, engine shed scenes, famous trains, railway landscapes. 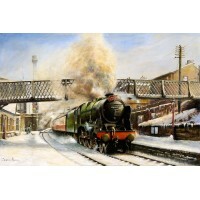 Open unsigned and signed limited edition prints available. 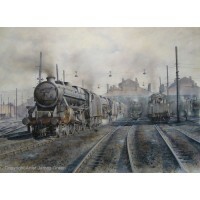 Weekday Cross Junction on the Great Central Railway in Nottingham. 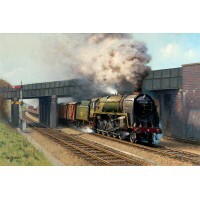 B1 4-6-0 passes with a freight tr..
A British Railways standard 4-6-2 Britannia class No.70013 'Oliver Cromwell' at speed on a Liverpool..
LMSR Coronation Class, LMS No. 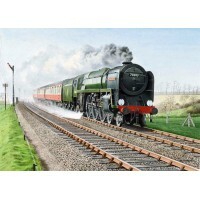 6235, British Railways No. 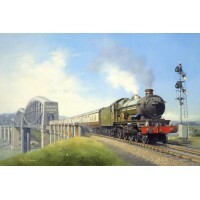 46235 City of Birmingham was originally bu..
Gresley class A3 pacific No. 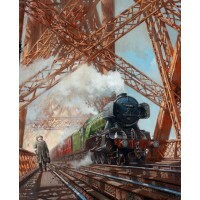 60100 'Spearmint' rumbles across The Forth Bridge in 1960. 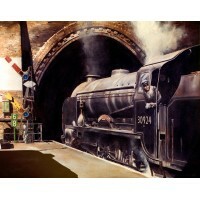 Signed..
Stanier 'Black 5' 4-6-0 locomotives at Willesden engine shed in 1963.Limited Edition print of 850 co..
Last days of the London trams. No. 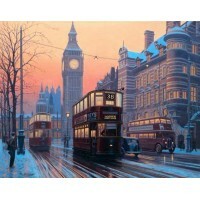 38 to Abbey Wood. 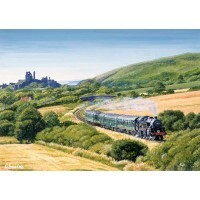 The South London trams and the routes that..
A Swanage bound train passes Corfe Castle in the mid 1960's headed by British Railways standard clas..
A fine summer day during 1958 bears witness to the up 'Cornish Riviera' headed by a 'Castle' class 4..
A Great Western Railway Castle class 4-6-0 loco heads a down train through Dawlish station in atroci..
BR class 9F No.92220 approaches Southam Road and Harbury Station in 1960. The station was opene..
L.M.S. 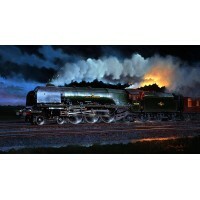 Royal Scot class No.46145 The Duke of Wellington's Regiment. 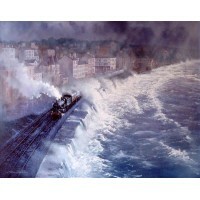 (West Riding), thunders through ..
Maunsell 'Schools' class 4-4-0 locomotive No.30924 'Haileybury' about to enter the 788 yard Hastings..